How to Install TWRP Recovery Xiaomi Redmi Note 4, Root, and Enable Face Unlock Feature. 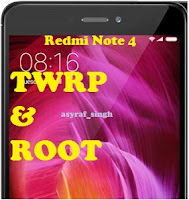 Install TWRP Recovery Redmi Note 4. All Android operating systems have a recovery system, which works for Android system management. This is a standard recovery from manufacturers with limited features. So, if you want more flexibility in modifying the Android device. You can replace standard recovery with TWRP recovery. TWRP recovery offers several advantages than standard recovery. And now, guidebelajar will show you the easy steps to install TWRP recovery on Xiaomi Redmi Note 4. TWRP recovery installation is the first step to do more. You can install zip-based files on your phone. For example, get root access by installing SuperSU Zip file or flash other Zip files to unlock more feature on your device. Ok, let's we start this guide. You need to enable USB debugging on your phone. How to enable USB debugging on Redmi Note 4? Tap Developer Options - here you can enable OEM Unlock & Enable USB Debugging. Make sure MiFlash Unlock Tool is already installed on the computer. If not yet, you can download the MiFlash and then installed on the computer. If you got an error when running the program windows, please see more instruction how to get Mi Unlock tool below. Download Latest Platform Tool for Windows. Download lazyflasher-no-verity-opt-encrypt.zip - For Root. Enter Fastboot Mode Xiaomi Redmi Note 4. Once your Xiaomi Redmi Note 4 completely Power off, then enter your device into fastboot mode. How to enter Xiaomi Redmi Note 4 into fastboot Mode? Press and hold the Power button + Volume down button at the same time. Release all button when your phone enters fastboot mode. You will see the following picture on your phone. Then, connect your phone to the computer using the USB cable. Now, the computer will automatically install the driver for Xiaomi Redmi Note 4. How to Download Mi Unlock Tool. Then click Unlock Now button. Then fill all available form on the site. This form contains the following data. Then type the real reason for unlocking in English. Then tick I confirm that I have read and accepted the unlocking Disclaimer. You will get a message on your phone according to the phone number you have entered above. Once you get the notification, back to the website and download Mi Unlock tool. Once you get the SMS, you can directly go to the following URL to download Mi Unlock tool. Now, install Mi Unlock tool on the computer. How to Unlock Mi Phone. Check your Mi Unlock Status on your Redmi Note 4. How to check Mi Unlock Status? Make sure developer Options is activated, see how to enable developer options above. Then tap Mi Unlock Status - if you see the message that says This device is locked the phone is secured then you need to unlock Mi device. How to unlock Mi device? Now, launch the Miflash Unlock tool on the computer. You need to log in with a verified account when you unlock the bootloader. Make sure your Xiaomi Redmi Note 4 also Log in with the same account. Once you have successfully Login to Miflash Unlock tool, now click Unlock button. Just wait for the process until done. and the Miflash Unlock say Unlocked Successfully. Now, click reboot phone button. Once your Redmi Note 4 boot up again, you can back to step 1 above to check Mi Unlock Status. Install / Flash TWRP Recovery Redmi Note 4. Make sure your Redmi Note 4 in fastboot mode. Move or copy TWRP recovery (recovery.img) to the platform tool folder. From the platform tool folder, open CMD window How to do it? From the command prompt window, type the following command and press enter. Once your device listed, now type the following command and hit enter. This command will force your device into the TWRP recovery menu. How to Enter TWRP Recovery Using Button. If your phone is not in a fastboot mode, you can use the following button to enter the TWRP recovery without a command. Once it completely powers off, now press and hold the following button at the same time. How to Root Redmi Note 4. You need to copy two files already downloaded as prerequisite above. (SuperSU-v2.79-201612051815.zip and lazyflasher-no-verity-opt-encrypt.zip) to the Phone storage or SD Card. Use the USB cable to transfer it from the computer to your phone. Then, enter your phone into TWRP recovery. From the TWRP main menu, tap Install. Then, browse the file which has been copied before. Tap the file (SuperSU-v2.79-201612051815.zip) and then swipe to start to install the file. Once it finished. Tap back. Now, navigate to the Lazyflasher-no-verity-opt-encrypt.zip then tap and swipe to start to install the file. Once two files already installed/flashed you need to reboot your phone. How to Enable Face Unlock Redmi Note 4. Copy FaceID-Santoni_9.2.5.zip to the SD card or phone internal memory root folder. Tap the file and then swipe to start to install the file. Once the installations finished, reboot your phone. 0 Response to "How to Install TWRP Recovery Xiaomi Redmi Note 4, Root, and Enable Face Unlock Feature."